Here is the other dish from our Italian date night. Ontario red peppers are in season which means they are huge in size and low in price. This is a fairly simple soup that tastes great (if you like roasted red peppers) and has a deep red colour. They say that red stimulates the appetite, so this is the perfect starter for your Italian meal. 1. Roast peppers under the broiler or on the BBQ (I think this is the easiest way), rotating until skins are blackened and wrinkled all over. Place in a large bowl, cover with a plate, and let steam for 15 mins. Skin peppers and chop. 2. Meanwhile, heat oil in a large pot over medium heat and saute onions and garlic for 5-7 mins, until onion is translucent. Add potatoes and fry for 1 min. Add peppers and water and bring to bubbling. Reduce heat and simmer for 15 mins, or until potatoes are soft. 3. Blend soup with a hand blender until smooth, then season to taste. Before serving, stir in soy creamer. 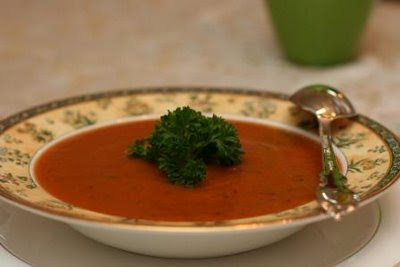 NOTE: If you are in a rush, use only four cups of water and serve after you have blended and seasoned the soup. If you have the time, use 5 cups of water, but let soup simmer, uncovered, for a few hours after blending. This will thicken the soup and let the flavours develop.